From Brampton, Ont. to Burnaby, B.C. NDP Leader Jagmeet Singh arrives for a news conference in Vancouver on July 13, 2018. Federal NDP Leader Jagmeet Singh is hoping his ticket to Parliament is thousands of kilometres away from where he cut his political teeth. 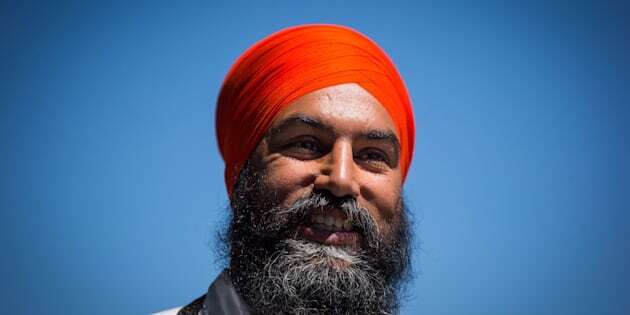 Singh, a former Ontario legislator who won the NDP leadership last October despite not having a federal seat, announced Wednesday that he will run for the party in an upcoming byelection in the British Columbia riding of Burnaby South. The seat has been vacated by former NDP MP Kennedy Stewart, now running for mayor of Vancouver. Taking the plunge may make political sense given that the Trans Mountain pipeline, which Singh opposes, is a key issue in the riding. Still, the move is not without risk. Failing to keep an NDP seat could prove disastrous for Singh, who has already had to answer for a string of disappointing byelection results and fundraising numbers that are so poor he is declining a salary from the party. Singh represented Brampton, Ont. provincially and had suggested he would prefer to run in that city federally as well, repeatedly telling reporters he was comfortable waiting until the 2019 election. He sat out earlier byelections in B.C., Ontario, Saskatchewan, and Newfoundland and Labrador, noting former late NDP leader Jack Layton also waited until a federal election to take his crack at a seat. After months of bad news, including caucus strife and drama, Singh has evidently decided he needs to get to Ottawa full time. While it may seem unusual that a party leader would ask for the support of voters in a place in which he has no immediate connection, it's nothing new. And as history shows, there's nothing stopping Singh from trading Burnaby for Brampton in 2019, if he wants a riding closer to home. However, Singh told reporters Wednesday that he will move to Burnaby and run again there next year if he wins the byelection. "I've committed to this riding and I'm committed all the way," he said. Here are some other recent examples of party leaders who went to unexpected places to seek their path to the House of Commons. Though known as "The Boy from Baie Comeau," Brian Mulroney found himself pressing the flesh in Nova Scotia shortly after winning the leadership of the Progressive Conservatives in 1983. A Quebec businessman and lawyer, Mulroney didn't have a seat at the time and was anxious to exercise his role as leader of the Official Opposition. In order to make room for Mulroney, longtime Tory MP Elmer MacKay (the father of later PC leader and federal cabinet minister Peter MacKay) stepped down in the Nova Scotia riding of Central Nova. Brian Mulroney carries his son Mark as he makes his way to a swearing-in ceremony with his daughter Caroline in this Sept. 6, 1983 file photo in Ottawa. Mulroney won the byelection in that riding and represented Central Nova until the 1984 federal election, when he moved over to the Quebec riding of Manicouagan. As for MacKay, he was elected again in Central Nova in 1984 and stayed there until 1993. And what about "The Little Guy From Shawinigan"? Jean Chretien represented the Quebec riding of Saint Maurice for more than 20 years when he stepped down in 1984, not long after a losing his bid for the party leadership. After a few years in the private sector, Chretien won the Liberal leadership in 1990. However, like Mulroney before him, he lacked a seat. Liberal MP Fernand Robichaud stepped down in the New Brunswick riding of Beausejour, sparking a byelection that Chretien won. The Liberal leader would represent the N.B. riding for about three years while Robichaud served as a special assistant in the Opposition leader's office. Jean Chretien tries on a cowboy hat after registration at the Liberal leadership convention in June 1990. In the 1993 federal election, Chretien ran again in Saint Maurice and Robichaud ran again in Beausejour. Both were successful. Robichaud was rewarded by serving in Chretien's cabinet and was later appointed to the Senate. Before he became leader of the Canadian Alliance in 2000, Stockwell Day was a longtime member of the Alberta legislative assembly and served in cabinet posts under premier Ralph Klein. Needing a seat and eager to get himself known nationally, Day ended up running in the British Columbia riding of Okanagan-Coquihalla that year. The byelection was sparked after Alliance MP Jim Hart stepped down in the reliably blue riding. Day won there easily and made the fateful decision to don a wet suit and take a Jet Ski across the Okanagan Lake for his first press conference as an incoming MP. You know, normal B.C. stuff. Canadian Alliance leader Stockwell Day arrives at a news conference on a Jet Ski on Okanagan Lake in Penticton, B.C. on Sept. 12, 2000. Though the stunt was widely panned, Day decided to stick with the riding even after he lost the Alliance leadership less than two years later. He stayed on as the MP for the riding until 2011 and served in key cabinet posts for the Conservative government, including public safety and Treasury Board president. In 2007, Liberals asked the RCMP to investigate allegations that Hart struck a compensation deal of up to $50,000 with the Alliance in order to step down and clear a path for Day. Mounties ultimately cleared Day and Hart of wrongdoing. Former prime minister Joe Clark is such a son of Alberta one could be forgiven for forgetting he once spent a few weeks representing a riding in Nova Scotia. Clark was briefly PM between 1979 and 1980 and later served as a cabinet minister under Mulroney. Though he stepped down in 1993, Clark returned to politics five years later to win the PC leadership. It took about two years before PC MP Scott Brison resigned to make way for Clark. Much like Singh today, Clark was not leader of the Official Opposition at the time. Joe Clark addresses supporters after winning the byelection in the riding of Kings-Hants in Wolfville, N.S. on Sept. 11, 2000. Clark's wife Maureen McTeer, left, Scott Brison, who gave up his seat for the byelection and Clark's daughter Catherine, right, are shown applauding. Clark won the riding in a byelection in September 2000, on the same night Day won his in B.C. When a federal election was held in November of that year, Clark ran successfully in Calgary Centre instead. Brison would later join the Liberals after the PCs and Alliance merged. He's currently the Treasury Board president. Elizabeth May was anything but shy about wanting a seat in the House after she became leader of the Green Party in 2006. Though born in Connecticut, May grew up on Cape Breton, N.S. May ran in a byelection in a London, Ont. riding in 2006, finishing a respectable second to the Liberal candidate. In the 2008 federal election, she ran in Central Nova against Peter MacKay. In a controversial twist, Liberals did not run a candidate in the riding to give May a better shot at unseating MacKay. Green Party leader Elizabeth May gives the victory sign as she speaks to supporters after being elected MP for Saanich-Gulf Islands in Sidney, B.C., on May 2, 2011. By 2011, May headed west and ran in the B.C. riding of Saanich-Gulf Islands. She made history by winning the first Green seat in the House. She has stayed put ever since.